AllThingsDigitalMarketing Blog: Name It. Change It. Press Conference: See What You Missed! Name It. Change It. Press Conference: See What You Missed! "When you attack one women, you attack all women!" -- Jehmu Greene, President, WMC. 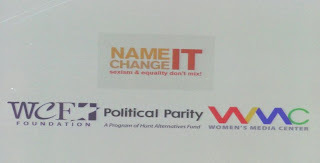 On Tuesday, August 31st, members and supporters of Women's Media Center (WMC), WCF (formerly Women's Campaign Fund) and Political Parity joined at the Paley Center for Media in New York City for a press conference to announce the national launch of Name It. Change It., the media accountability campaign that addresses sexism in the media against women candidates and whose goal is to stop sexist treatment of women candidates beginning with the upcoming 2010 midterm elections. 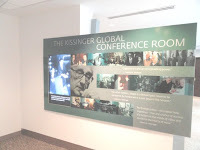 The event was also live-stream at www.nameitchangeit.org, www.wcffoundation.org, and http://www.womensmediacenter.com/. 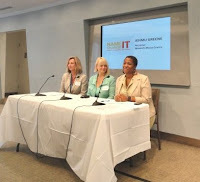 Jehmu Greene, WMC President and former advisor to Hillary Clinton, facilitated the conference and was joined by WCF President, Siobhan "Sam" Bennett, and Political Parity Co-Chair and former Lieutenant Governor of Massachusetts, Kerry Healey. "Media surrounds us, and when we don't see women in leadership roles, the mental jump to envision them is that much higher," said Greene who went on to share her favorite quote by the late Shirley Chisholm, NY Congresswoman (1968 to 1983; also first black woman elected to Congress). "Emotional, sexual and psychological female stereotyping of females begins when the doctor says 'it's a girl'!" -- Shirley Chisholm"
"And today we're launching Name It. Change It., a media accountability project just for that exact reason," added Greene. Highlights of the press conference included startling statistics pertaining to women in political office, the premiere of the campaign’s online video titled "In Your Face with Mark and Friends," created by Strategic Productions, and a newly created "Egregious Incident Alert System" (aka SAS, Sexist Alert System), "The Pyramid of Egregiousness," etc.). Pyramid of Egregiousness Diagram includes a color-coded system in shades of orange, to identify the three degrees of sexism in media. 1. "Just plain sexist" (bottom tier, lightest orange); 2. 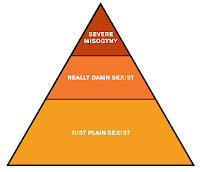 "Really darn sexist" (middle tier, orange); 3. "Severe misogynist" (third, tier, deep, burnt orange). Note, 50% fall in the "just plain sexist" tier while the remaining 50% fall in the other 2 tiers, "really darn sexist" and "severe misogynist." 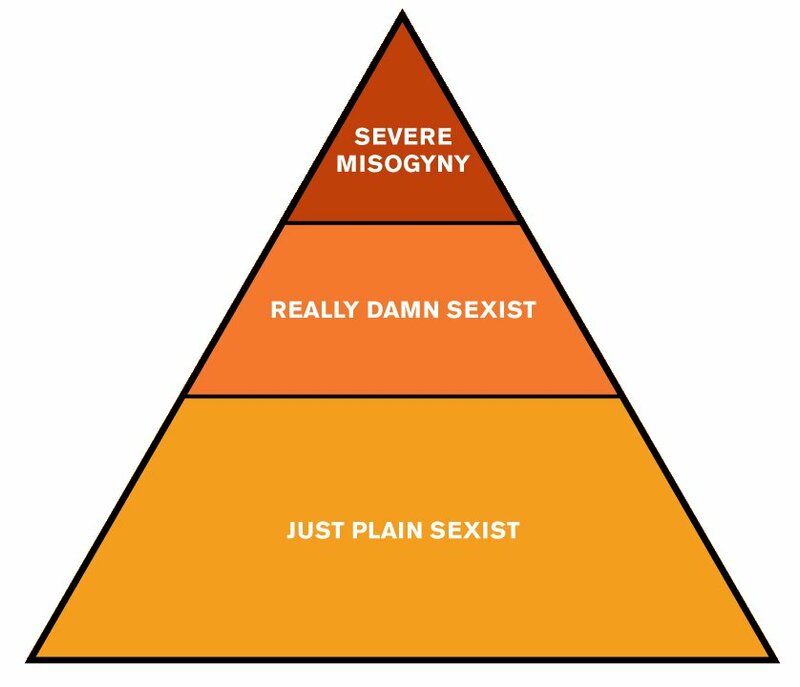 The goal of Pyramid of Egregiousness model is to encourage everyone to report any sexist treatment of women in the media and characterize it by the color-coded diagram. When you go to the Pyramid's URL mousing over a tier shows sample phrases (e.g., the"Just plain sexist" tier includes the phrase "high maintenance," etc.). The conference also featured a provocative and interesting Q & A. Unfortunately, there is more than enough of statistics and egregious stories when it comes to sexism in media. Did you know that the U.S. currently ranks 86th in the world for the number of women in Congress and that 51% of Americans are women, yet women hold only 17% of the seats in Congress, and 24% of State Legislature seats? And all indications are that much has to do with sexist treatment by the media and lack of awareness and support. Greene shared a familiar and compelling statistic with the audience from the Geena Davis Foundation Institute on Gender in Media that had to do with the correlation of hours spent watching TV for girls and boys -- The more hours that girls watch TV the less options they feel they have in life. For males, the more they watch TV the more sexist they feel. More information about the "One on One" session at the Paley Center for Media this past April is at http://bit.ly/GeenaDavis-PaleyCenter4Media. "Women are singularly responsible for us being here today," added Greene who then introduced Siobhan "Sam" Bennet, President, WCF who is also a former Congressional and Mayoral candidate in Pennsylvania. Bennett faced egregious sets of sexist attacks against her personally while campaigning for office, and she courageously went on to take that experience and turn it into a positive campaign to support all women, regardless of their political party, who are seeking leadership roles in government. Bennett joined the WCF, the oldest organization (36 years old) in 2009 and has been hard at work in fighting sexism against women candidates. In such a short time, many have witnessed the amazing transformation from a social media standpoint of her work in fighting sexist against women and to bring more women into elective office on all sides of the aisle. "Sam Bennett has marshalled in this campaign in such an aggressive and necessary way," said Greene as she announced Bennett. "Did you ever have a moment where you're surrounded by luminaries and ask how did I get here?" opened Bennett, as she continued by sharing her impressive thoughts about her fellow colleagues on the panel. "Jehmu is an amazing young woman and it's a real honor to be working with WMC and Kerry Healey, former Lieutenant Governor of Massachusetts, an amazing women, a Republican who is out there on so many issues and she is the co-chair of a historic alliance of women's organizations across this country called Political Parity. To be among this august company is so powerful, such an honor," added Bennett. Bennett also thanked Swanee Hunt, of the Hunt Alternatives Fund, for her energy, insight and experience. Hunt could not be here today but she was surely missed. Bennett went on to describe how honored and proud she is to be leading the WCF organization and how it has been helping women campaigning for political office for 36 years. "There is not a women of tenure on the hill that did not get a first check from the Women's Campaign Fund. Ask Democrat Barbara Boxer, ask Republican Olympia Snow," said Bennett. It was compelling to learn how Bennett experienced the most breathtaking misogyny from the media in her own hometown where she's lived for over 30 years. Bennett was a PTA President and founded several civic organizations in her community; but when she ran for mayor she had a taste of sexist treatment by the media. As Bennett was running for Mayor (which incidentally she lost by only 46 votes) and was doing her first stump speech, she was interrupted by the chair of that meeting who said "Sam I want to ask you a question all the men in this room have been dying to ask you - just what are your measurements?" recalled Bennett. "And there was a reporter who wrote an article about this meeting and didn't even mention it," added Bennett. Bennett went on to describe that when she ran for Congress, that experience paled in comparison to what came her way during her next campaign. "I'm very proud to say I've raised more money but the bottom line is this -- I came away that I want to focus on helping get more women in elected office. My state ranks 46th in the US of women in elected office so something is very wrong," said Bennett. Bennett introduced Kerry Healey of Political Parity as a visionary who inspires all the women around her. Kerry Healey mentioned experiences throughout her campaign that although they were very humorous they also were so important because it is exactly these types of sexism things that frighten and deter other women into wanting to run for office. Disappointingly, female journalists are just as guilty as male journalists. Healey experienced the most disappointing question as she was on a radio interview by a woman journalist. She was asked if she got elected to office was she going to have twins during her term. The strategy behind this media question was basically due to the fact that her predecessor, also a woman, had twins during her elected office term. "Well obviously, at my age, that would be impossible," said Healey, and the audience laughed. Healey's defeat was actually celebrated and ridiculed in the Boston Globe, caricaturing her as a witch with black hat and all, but with blonde hair. "Political Parity was an idea because Swanee Hunt of the Hunt Alternatives Fund, started talking about a bipartisan effort to get women elected on both sides of the aisle," said Healey. Another key contributor was unable to attend today's conference, Lauren Emory, an amazing supporter of women causes particularly concerned with the fact that there has never been a women's effort to get women elected on both sides of the table before. Healey expressed much appreciation and gratitude as she described how she became involved through Political Parity. "The Emory Family Foundation provided the funding and without Lauren Emory, we wouldn't be here today. Lauren is a terrific supporter of women causes," said Healey. Healey continued by reading a statement from Lauren Emory. "The Political Parity project is a historic and timely initiative for women around the nation of all different backgrounds, cultures and belief systems who are convening and saying it is time is for real change. And we together are going to make it happen. The Emory Family Foundation is honored to be a resource partner for Political Parity's media accountability project headed by WCF, WMC, and Lake Research. We believe the time is now to put our dollars forth in greater numbers for research and find the projects that are in the forefront of this change. The media accountability is one of these projects." -- Lauren Emory, Emory Family Foundation. Interesting statistics from research pertaining to reasons why few women consider running for office were addressed and the facts why we must examine why this is so. Did you know women strongly consider running for office 50% less than men? Two important findings were that women feel they already have 2 jobs -- a real paying job and job at home (dishes, laundry, husband, etc.). Women still disproportionately make sure households run well and a main reason women don't go into politics is because they view it as another job. "Why would I sign up for 3 jobs?," said Healey. Exact statistics will be announced at the next Name It. Change It. Press Conference on September 23rd to be held in Washington DC. In summary, women look at how women candidates are handled by media and that is the direct deterrent for women to run. Male candidates don't worry about the job at home, etc. "How a woman is handled should be no different than how a man is handled," said Healey. Of those 50% women, 30% fewer of them ever run. Everyone in the audience raised their hand when asked if they believed that women are integral to making sure women bring something important to the table. 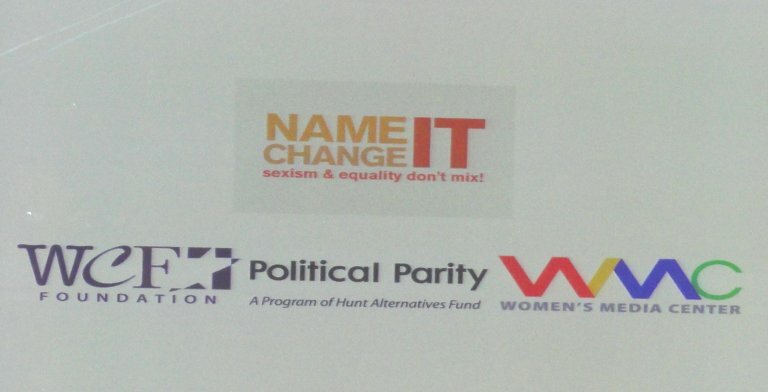 Kerry Healey mentioned the Rankin File, a campaign which compiles lists of women leaders who should be in Congress and makes sure these names get mentioned when electoral projects are announced or mentioned. The Rankin File program was named after Jeanette Rankin, suffragist, and the first women elected in House of Representatives 1917-1919, running again in 1941-1942. Before the Q&A segment, Greene mentioned how important this day is and shared a recent conversation she had with Jennifer Posner of Women Media in the News about the sexist comment when Geraldine Ferraro was nominated to be the VP, and Tom Brokaw introduced her as a size 6 along with the sexism in media toward Senator Clinton when she ran for President in 2008. ON THE NAMING OF "NAME IT. CHANGE IT." A series of questions and answers began with the first question from an audience member directed to Siobhan "Sam" Bennett. Q: "How did you respond to the question asking for your measurements?" A: Bennett expressed how she was unprepared. "What I should have said is I'll tell you my measurements if you tell me yours. Instead I stammered my way through it...you don't have a ready response," explained Bennett. Bennet shared how strategic bridges are creating solutions to these situations. It was interesting to learn that there is research conducted by Celinda Lake of Lake Research that attempts to quantify the electoral effect of sexist type statements and how womens' perceptions change when these statements come out. In an effort to help empower women candidates the research will include sample responses that women can make when they are confronted with such sexist situations and questions. There is not only data but the ability to submit helpful and strategic information about the most effective ways to respond to these questions and situations. Q: Another question was based on an audience member's opinion that feminism was founded based on pro choice; "So how do you support all women, yet the pink elephant in the room who wears glasses and is from Alaska (Sarah Palin) says she is a feminist yet doesn't represent what true feminism is all about (e.g., pro life vs. pro choice)?" The audience member continued "She says she is a feminist yet doesn't represent what true feminism is all about, she's pro life, feminism is pro chice, how do we treat her as equal?" A: Healey explained the fact that women are the majority and yet we regard ourselves as the minority due to bipartisanship. She continued mentioning that essentially this is the reason why these attacks come from women as opposed to men -- Because of the partisan underpinning of their hostility toward their candidate through misogyny. "All women deserve to be treated equally regardless of whether we agree with them, and this is the strength of this entire effort. It does not allow us to be defiant as women," responded Healey. Healey mentioned that she will defend Sarah Palin as needed since all women deserve to be treated in an even-handed way as men whether she agrees with them or doesn't like them will not be a factor. Bennett mentioned that so much happens because we normalize these kinds of conversations or descriptions about women candidates. "We need to take this off the table to talk about any movement for women," added Bennett. Q: Another question about Sarah Palin had to do with her stepping down midterm as Governor of Alaska. "Doesn't that mean an admission to a misogynist?" asked an audience member. A: Healey recounted her experience when she was asked if she was going to have children during her term in office. "All women cannot live up to a perfect standard and can't please all other women by other womens' behaviors... Right now women are being silenced by the fear of being criticized by the media....Sarah Palin has my support whether or not she expresses to have it. This goes to the core belief that everyone be accorded basic standard of respect, and this is what we're trying to accomplish so that they are free to express themselves politically," said Healey. Greene mentioned John Edwards when he was elected to serve as US Senator and during his first term how he decided to run for President. "Look at the parity, the equality as the goal for this campaign for women and men to be treated fairly by journalists, by bloggers, in the entire media world and that they are judged on the issues, the stances, and vision -- judged as leaders but not because of their judgment, said Greene. Q: The next question dealt with the way the media addresses Congress as "Congressmen" and never uses a unisex term such as Congress member. A: Green agreed that this issue needs to be addressed within the media especially women candidates and counterparts with an equal amount of experience. "We must make sure women are being judged and profiled as the same people that our male counterparts have been and continue to be," said Greene. Q: There was a question pertaining to whether the reach of Name It. Change It. purports to be domestic or global, particularly with the international sexist incident toward France First Lady by the President of Iran, labeling her a "whore" (severe misogyny on the Egregiousness Scale) for her humanitarian effort to the Iranian woman sentenced to being stoned to death. A: Greene explained that for 2010 the reach is domestic, but long term the program will broaden its reach in as much as possible. 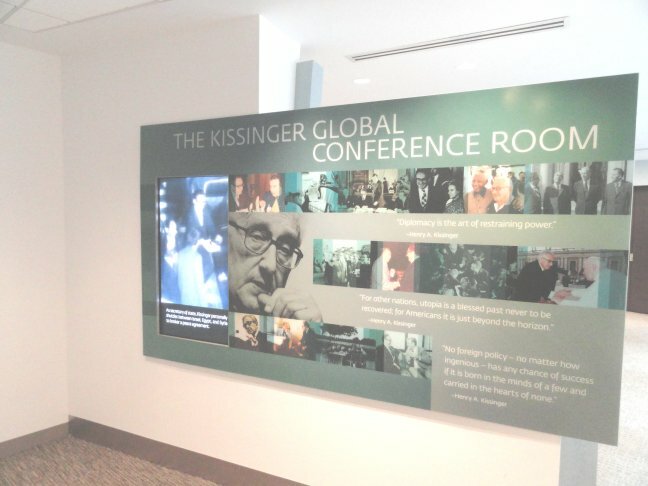 "We should all look forward to conversation by Sam and Kerry about how to continue to broaden the reach in the future. Taking a step back from Name It. Change It., the Women's Media Center very much wants to provide opportunities for visibility and action to make sure the situation in Iran and the activists engaged in fighting back have a platform and that their voices are being heard, something we do on a daily basis at WMC," said Greene. Bennett mentioned Rita Jensen, Editor in Chief at Women's eNews, her work and the importance to start in a domestic platform during the midterm elections. She then explained why our nation needs to be an international leader in how women are regarded so that our domestic work here is preeminently important especially as we need to set the example in how women candidates are treated. "As per Gloria Steinem, whatever we say about men, say nothing less about women. Women's Campaign Fund and Foundation have an opportunity to encourage women to run at all levels," said Bennett. Q: There was a question pertaining to whether Name It. Change It. has a specific outcome at the end of this campaign. A: Greene explained that if we look back to the 2008 election and notice the level of sexist attacks that candidates Hillary Clinton and Geraldine Ferraro faced. WMC was not just monitoring the attacks but developing a campaign to address it. Greene gave examples such as the comments from Chris Matthews who was then CNBC lead anchor. WMC put together a video and through many conversations and many actions did meet with MSNBC President who issued a very big apology. Chris Matthews also issued an apology and his actions resulted in him loosing his MSNBC anchor seat, now Matthews serves as commentator. "Maria Theresa Kumor became a contributor at MSNBC and Rachel Madow got her show so to look back and see that through a little bit of work and activism came outcomes," said Greene. Q: Another question had to do witth how Name It. Change It. will be measured. A: Greene mentioned that when we receive national response, we know we're on track, and from Political Parity's standpoint, many projects will allow women to feel more comfortable to enter the political arena and get elected. Measuring by how many more women run for office and be elected to office is the way this campaign will be measured. Q: The final question from the audience was about the participation of WMC co-founders Gloria Steinem and Jane Fonda. "Is Gloria or Jane going to be doing any appearances?" A: Greene explained that Gloria has been blogging about the launch of this campaign and will continue to do more posts. Also that Jane is engaged in the campaign and very much behind making sure we have resources that are effective. Greene shared an article from The LA Times (August 30, 2010 issue) which reported that we will probably be seeing our existing ten women House of Representatives and Senate seats and probably loosing the same amount of women seats in this competitive election. "The impact of this campaign is to make sure that we open up the doors and spread and engage more women and that they understand, now more than ever how important it is that we encourage women to run for office," said Greene. In closing, Greene thanked the live, online, and live-stream audiences as well as her fellow colleagues, Siobhan "Sam" Bennett and Kerry Healey, for being here.